The recipe and process for making fake yet realistic looking scars and wounds has been in practice for decades. 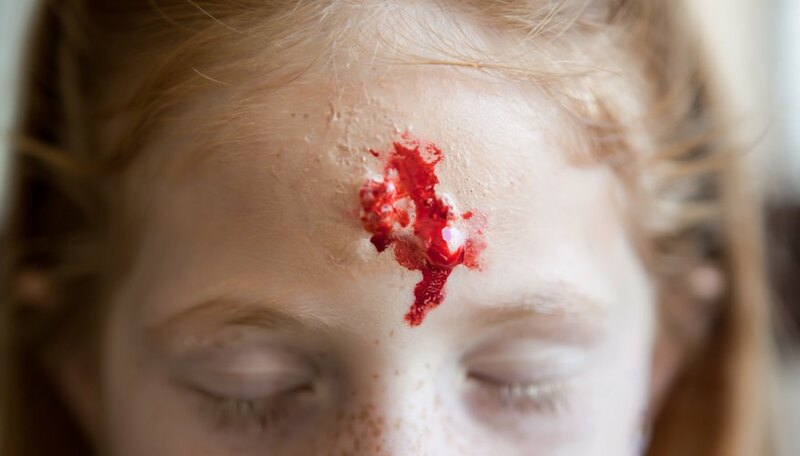 Whether used for film, theater or Halloween costuming ideas, making your own fake and gory injuries is limited really only by your imagination. There’s seemingly no end to the type and degree of gross wounds you can make, but an open gash to your forehead is a good place to start. Pin your hair away from your face. Wash your forehead with soap and water and pat your skin dry. 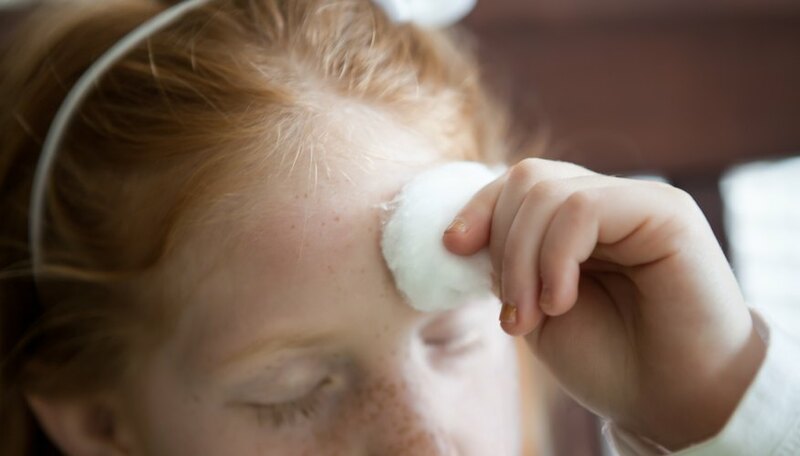 Dab a cotton ball with rubbing alcohol and use it to rub your forehead to clear away the natural oils on your skin. This helps the wound better adhere to your skin. Wipe away any excess alcohol. Boil the water, then mix it with the gelatin, using a popsicle stick to stir the two until well blended. Allow the concoction to cool (the mixture will thicken considerably). You want the gelatin mix to be hot but not enough to burn yourself, so test a dab on your finger to check the temperature. Use your finger or a cotton swab to add some petroleum jelly to your eyebrows. This will prevent the wound from sticking to the eyebrow hairs, thus reducing the painful pull on the hairs when you try to remove the gash. 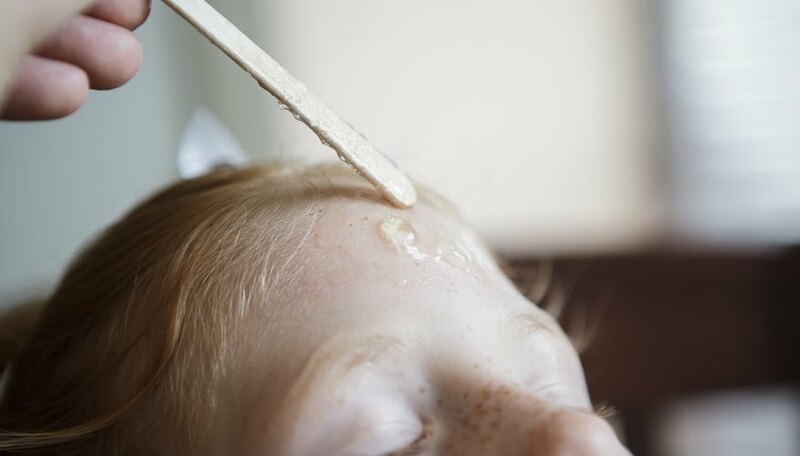 Apply a small teaspoon-size glob of gelatin mix to your forehead; tilt your head back slightly, then hold the glob over your forehead and allow it to drop from the stick onto your skin, holding the stick so that the glob drops in a diagonal line. Remain still with your head tilted to allow the glob to solidify. Apply another teaspoon-size amount of the gelatin mixture to your forehead in the same manner, only this time hold the stick slightly above where the first glob fell, thus creating two folds of skin with a gap in between them. Allow the new glob to solidify. Once dry, brush on foundation makeup to the globs, giving them the appearance of skin. 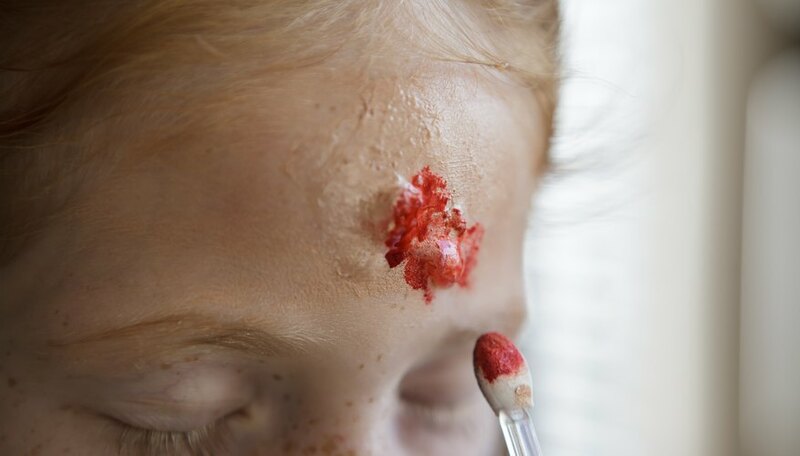 Use another swab to apply the dark red blush to the insides of the gash to give the appearance of a wound, or use commercially available fake blood. In lieu of storebought fake blood, mix 1/4 cup water with a few drops of red food coloring and some cornstarch to create some runny realistic blood to apply to the gash if you’re going the gory route. Make scars by skipping the second glob application and not applying the blush/blood.